This metallic beauty is one of an estimated 4,000 bees native to the U.S., hundreds of which haven’t been scientifically named yet. Around this time of year, bees like the one pictured above are busy buzzing around blueberry fields in the Eastern United States, from northern Michigan to North Carolina. 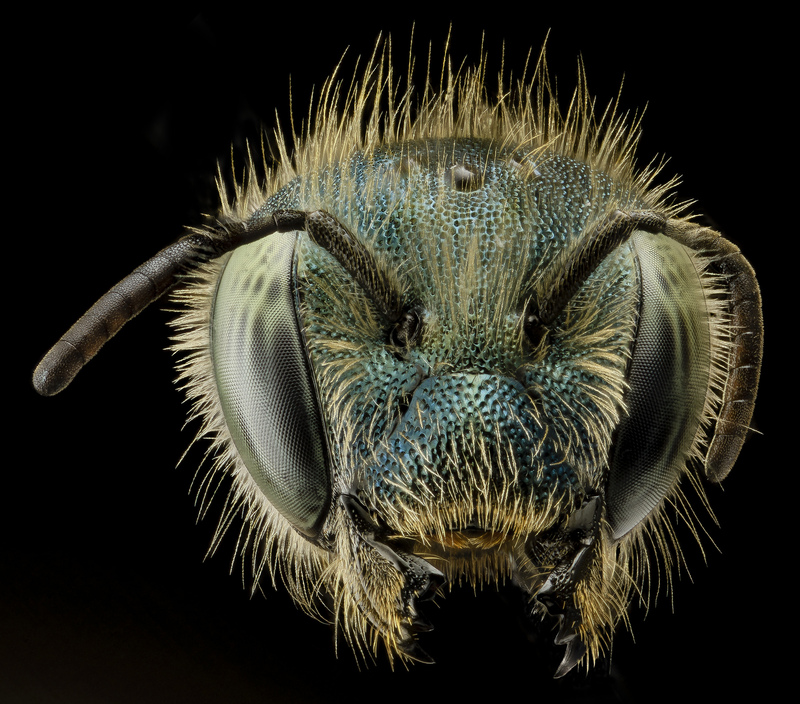 The portrait is just one in a growing digital catalog that scientists are putting together to help researchers identify native bee species—of which there are an estimated 4,000—that they find out in the field. Call it a “who’s who” of the native bee world. Physical collections of native bee specimens are disappearing fast from universities and museums whose budgets don’t have room for cabinets of insect specimens anymore, according to Sam Droege, a scientist at the U.S. Geological Survey’s Bee Inventory and Monitoring Lab in Laurel, Maryland. The USGS’s bee album helps fill the void to an extent. “We’re providing other scientists with very high resolution pictures they can drill into and [use to] look at the surface sculpturing and surface hairs and all the minutiae that goes into identifying bee species,” he says. Unlike honeybees found in the U.S.—which originally came from Europe and pollinate a wide variety of plants—most native bees have evolved to fill a specific ecological niche, pollinating flowers from a particular plant species or family, says Droege. For instance, the species in the photo above (Osmia atriventris, sometimes referred to as the Maine blueberry bee) is much better at pollinating blueberry and tomato plants than honeybees are, according to Droege. Blueberry flowers store pollen behind pores on their anthers that open when the bee provides something like a secret password. “[The insects] have to sing a certain song in order for the flower to let the pollen down,” he says, “Osmia atriventris, they know the song,” which they perform by buzzing at a particular frequency in a process called sonication. The buzz vibrations cause the pollen to shake loose. Once the treasure is exposed, the bees carry it underneath their abdomen. To see more photographs of native bees, check out the Bee Inventory and Monitoring Lab’s flickr page. Several major airports have found a new use for open but restricted space alongside runways and hangars—as a home for beehives.